This rice has a strong ability to absorb the flavours of herbs, spices and much more, and that is why it is used in variety of Afghan, Iranian and Indian cuisines such as Qabuli, palaw, Biryani etc. 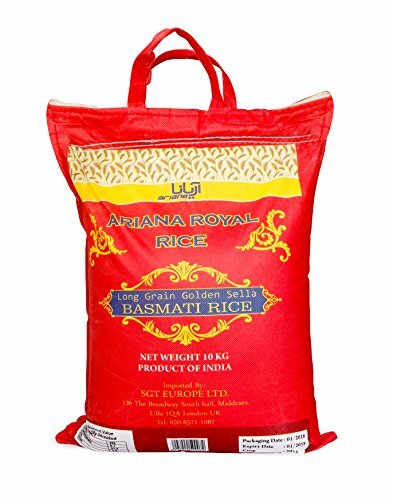 Ariana Royal Rice is a long-grain golden Sella Basmati rice from India. It is considered to be one of the best-quality rice with its distinctive aroma. When cooked, each grain remain separate, giving a light, fluffy result. It is the perfect rice used for Afghan and Iranian dishes such as Qabuli, Palaw Biriyani, Chalaw and also best as accompaniment to Indian curries, Mughlai, Continental and Chinese dishes Ariana Royal Rice also stands high in terms of unmatched quality, rich aroma, strong flavour and standard grain size. Our rice is widely acknowledged across the Europe and the UK for its unique taste and tempting aroma. Ariana Royal Rice grown under environmental-friendly conditions using high grade seeds, while ensuring suitable climate and hygiene. This rice has a strong ability to absorb the flavours of herbs, spices and much more, and that is why it is used in variety of Afghan, Iranian and Indian cuisines such as Qabuli, palaw, Biryani etc. A dish can look appealing if golden Sella rice is used. Since, the grains are elongated post-cooking and further adds aroma, flavour, fragrance as well as visual beauty to the dish. Also, each rice grain separates out perfectly after cooking.